What You Need to Know about the Pilates Hundred Training. Northern Beaches physiotherapy proven exercise program will inevitably be part of the treatment plan. The Hundred is an integral part of the warmup to all Pilates workouts, and it warms up your body in several ways: by improving your breathing, strengthening your Powerhouse muscles, stretching and opening your spine and chest, getting your heart to pump vigorously, and speeding up the circulation of blood throughout your system. The Hundred can be an extremely challenging exercise, but beginner-level modifications make the Hundred doable for Pilates first-timers, too. This is an important exercise to master; the core skills you learn in the Hundred are essential to the Pilates method of body conditioning (and they help keep your body operating at top form). What Is the Hundred? The basic Hundred movement involves lying on your back, head and shoulders lifted and curled forward with your legs stretched up in the air at an angle determined by your current ability-the level of difficulty your body is capable of tackling safely and effectively (the lower your legs, the more strenuous the Hundred becomes). You then pump your arms up and down to stimulate your heart, while you breathe deeply When you do the Hundred, nothing moves but your arms; your legs remain still and your belly is scooped and powerful. o The Hundred improves your breathing by expanding your ribcage and lungs, especially the important and often overlooked back part of your lungs. By lengthening and strengthening the muscles that surround the ribcage, the Hundred converts your lungs into an amazing bellows for pulling new air in and pushing old air out. o The Hundred develops a strong, flat abdomen and a solid “core.” It works the important muscles of your Powerhouse, especially that deepest layer of your abdomen’s corset muscles, the transversus. The Hundred strengthens and lengthens the spine as the top of your spine curls up and over while your legs stretch in the opposite direction. o The Hundred focuses your mind; as the first exercise, you use it to stimulate and awaken all of your Pilates principles-awareness and concentration, centering, precise control, flowing movement, oppositional energy, and breathing. The Hundred derives its name from the maximum number of arm pumping movements you do. Joseph Pilates recommended that you not exceed ten breaths (with five pumps for each inhale and each exhale, for a total of 100 pumps) in any one exercise session, as this would put undue stress on your system. o The Hundred stimulates your brain and nervous system by requiring you to coordinate counting, arm pumping, and breathing as you maintain your body’s proper form. o The Hundred integrates your whole body into one powerful entity, as it helps connect the strength of your upper and lower body with that of your Powerhouse. The Basic Hundred Exercise The basic Hundred is an intermediate version of this important Pilates exercise. If you’re at a beginner’s level, use the beginner’s modifications; later sections will present you with advanced modifications as well. No matter what your level or which modifications you use, the following steps represent the basic movement and breathing directions for this exercise. 1. Lie on your back, knees bent, feet flat on the mat, legs squeezed together. Your arms are extended along the mat, close to your sides with fingers pointing toward your feet. 2. Inhale fully scooping your belly in and up your spine; then exhale as you curl your upper spine, shoulders, and head off the floor, following the fundamental movement of the upper spinal flexion, which you have practiced in the Upper Body Curl mini-exercise. Don’t just lean forward in space; you’ll crunch your abs and compress your spine. Try to coil and stretch the upper vertebrae of your spine up and over, the way a wave curls over a surfer. Ideally the bottom tips of your shoulder blades maintain contact with the floor. 3. Allow your eyes to focus on your scooped belly as you inhale, then exhale deeply to draw your knees up, one at a time, toward your chest while you lift your arms and hands even with your shoulder height, palms down. As you do the Hundred, keep your shoulders wide and your chest open. Scrunching your shoulders in toward your chest or up toward your ears inhibits your ability to breathe deeply throws your posture out of proper alignment, and diminishes the effectiveness of this exercise. Remember to keep your body position stable and well-supported at all times. Do this by engaging your abdominals as well as the other muscles that attach to your pelvis, including your buttocks, thighs, and pelvic floor (the muscles that connect your tailbone, sitz bones, and pubic bone). And don’t arch your back! 4. Let your next inhale lengthen your spine in both directions; then deepen your scoop to squeeze the air out of your lungs. This action stabilizes your pelvis and lower back as you stretch your legs up and out to the angle that gives the Hundred the level of difficulty your body can safely and effectively perform. 5. 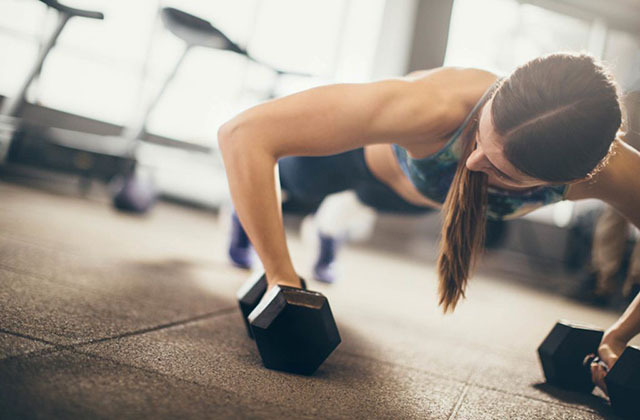 Inhale deeply as you pump your arms in an up-and-down movement five times; then exhale completely as you continue to pump your arms up and down another five times. Keep your wrists flat and straight, and don’t lock your elbows or allow your hands or arms to touch your body or the floor. Your pumping motion should be vigorous but without strain, and should rise about 10 inches off the ground. As you pump your arms in the Hundred, imagine that your arms are moving against gentle resistance-as though you’re pulling a canoe paddle through the water. Your arms should be strong and free of tension. 6. Repeat steps 5 and 6 up to nine times, but do not exceed 100 movements (ten complete inhalations and exhalations). 7. Keep your awareness and concentration as you slowly bend your knees to your chest, place your feet on the mat, and then lower your shoulders, neck, and head with control until you’re at rest. Notice what you feel. Are you warm? Is your belly burning? Is your mind awake?